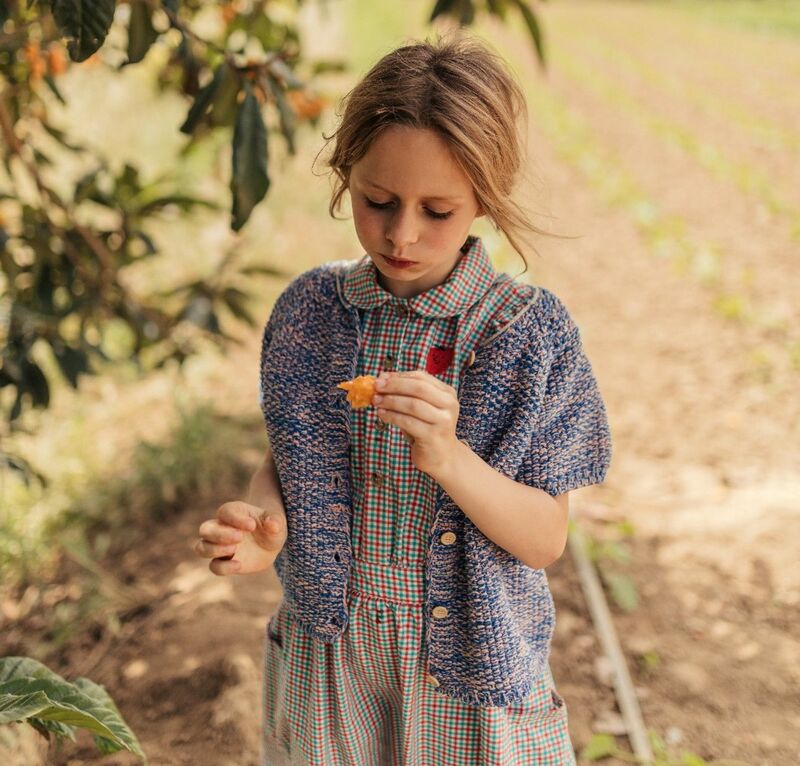 Bobo Choses SS19 "To Make a Garden"
Beyond the seventh sea, in a faraway land, there was a clothing brand that spoke the language of childhood... We present the brand Bobo Choses and latest collection spring-summer 2019 "To Make a Garden". Ah Bobo! You are so beautiful. Bobo Choses was founded in 2008 in Barcelona. The intention of the founders was to create a brand that would become the epitome of the magical and passionate language that children use to express themselves. Often without words. The name Bobo Choses is a creative combination of the word bo-bo, as easy to pronounce for babies, which at the same time signifies innocence in Spanish, and the words 'choses', which resulted from Spanish 'cosas' meaning 'things'. 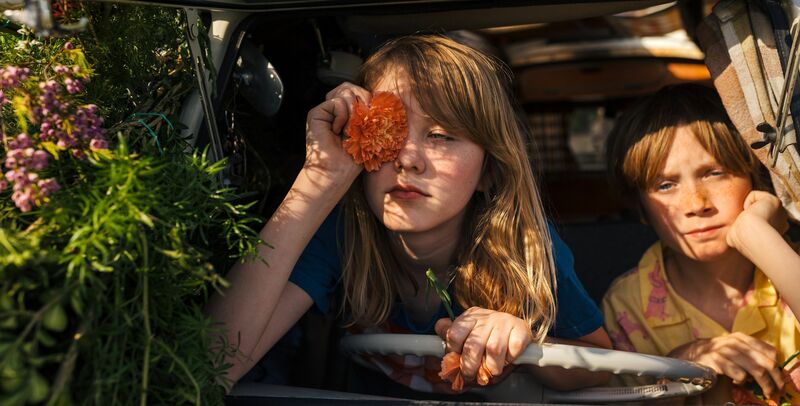 The creators explain their choice with the desire to present the brand as having something to do with all the things belonging in a child's universe. From shoes to rugs, to mummy's handbag. The first official collection from Bobo Choses - called The Englishman and the Sitting Bull - had its premiere a year later. It was enthusiastically received by children, parents and the media alike. Ten years have passed since those days and nowadays, the locally created Bobo Choses designs can be found in the most prestigious childwear boutiques in more than 30 countries worldwide. Bobo Choses is ceated by a team of 15 extremely creative designers, passionate about the children's world, who work each day to develop more and more pleasant and fun-filled ways to connect us to children's imagination. The Creative Department of the company is personally run by the CEO and founder of the brand Adriana Epserabla, and the business headquarters are located in an old toy factory on the Mediterranean coast, 50 kilometers from Barcelona. This location is incredibly inspiring in itself. In spite of all that Bobo Choses can offer us today, the brand's beginnings were quite modest. In one of her interviews, Adriana admitted that she first attempted to create children's clothes with her friend spontaneously, when they both realised that they couldn't find good-enough children's clothes in stores, so they decided to produce their own mini-collection of printed children's t-shirts and try their luck at Playtime Paris, hoping that they could sell something. Today, Bobo Choses enchants us with the magical world of children's communication through a wide range of clothing products, footwear, and even decorative items. All designs coming from Adriana Esparabla's drawing board impress with their tasteful style and a unique sense of humor that is neatly woven into all collections. 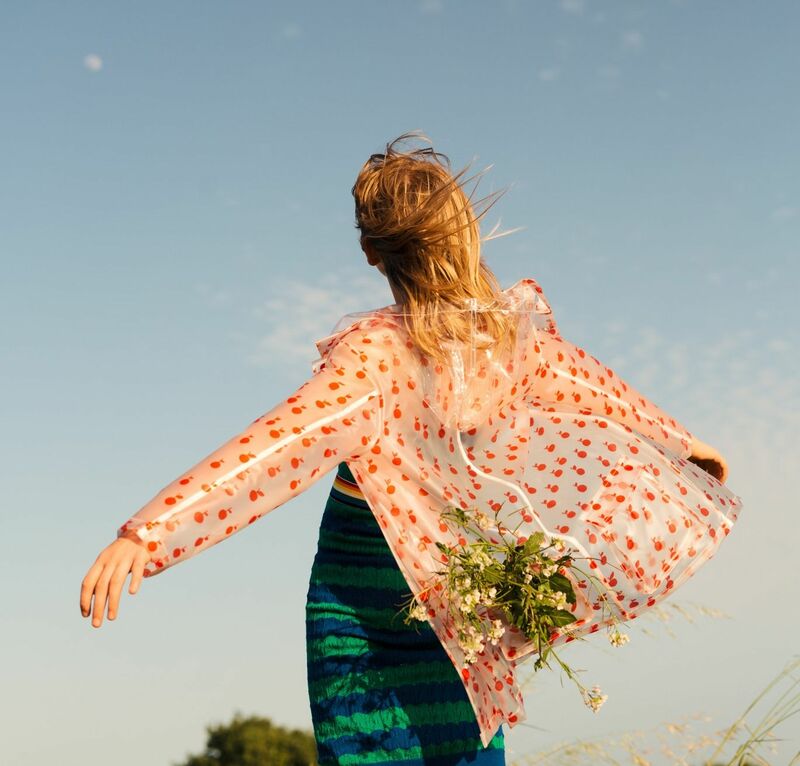 Each of the unique clothes from Bobo Choses tells us a fairy-tale that was created specifically for its needs and is published as a book, which means that their designs take on a completely new, fuller and deeper meaning. All of the hand-drawn illustrations placed on clothing prints, which have already become a hallmark for the brand, are created by Adriana. Adriana is also responsible for the choice of colours and textures of the materials, which bring the designs to life. It is said that the beautiful and passionate design of Bobo Choses allows you to lift both your feet off the ground, and the creators of the brand themselves admit that working on the collections is an extremely inspired process that allows them to be children in adult bodies. When creating new collections, Adriana's collaborators seek inspiration in every aspect of the world around us, but the most important is their own childhood and ... evanescence, perceived as a process of changing, learning and getting to know new things. Fleeting moments - filled with excitement. Adriana says that the most beautiful aspect of working on Bobo Choses is the opportunity to be continually immersed in the children's world - and watching little dresses of her own design running along the street. The creation process of Bobo Choses clothing lines is a game that fills the final result with overabundance of good energy. For the 10th anniversary of Bobo Choses, a special edition of t-shirts and backpacks was created and named Ten Years Young. 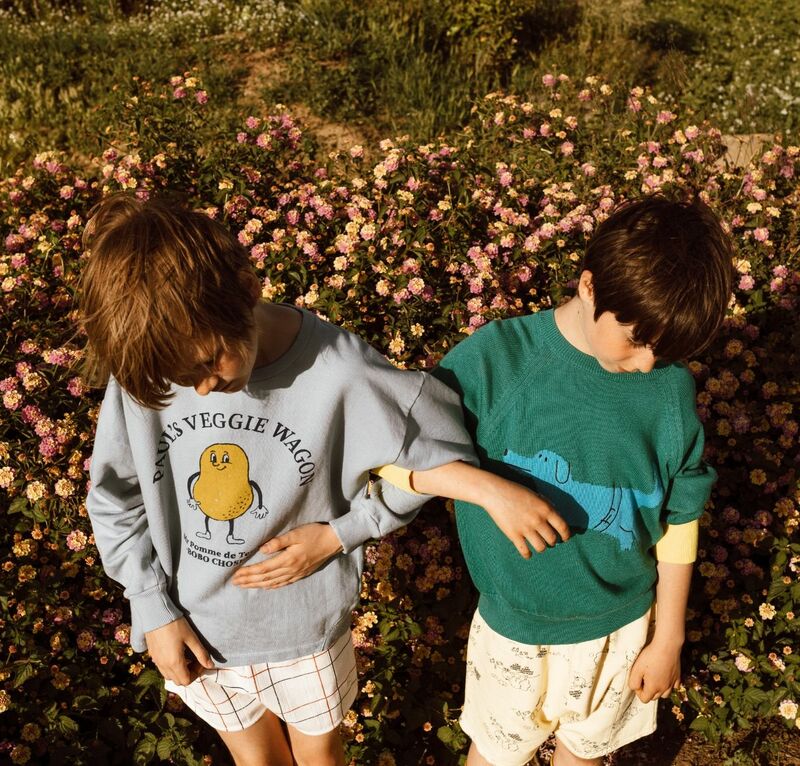 This year, Bobo Choses appeared at the 24th edition of Playtime Paris to proudly present their full Spring / Summer 2019 collection called To Make a Garden, which you can already buy from our store . During the fair, at the brand's stand, you could buy a Bobo Choses original post card, in which seeds had been embedded. The text on the card recommended simply planting it in the ground - your own carrots the future reward. The collection To Make a Garden directly refers to the springtime blossoming. The clothes in this collection have been decorated with designs inspired by children's drawings, depicting fruits, plants and animals. To Make a Garden maintains cheerful, fresh colours, in which warm pinks and oranges dominate, accompanied by refreshing blues and turquoises. This collection brings to mind childhood times spent in the countryside, completely carefree. It puts us in a mood in which time stopped and only the rays of the sun kissing our faces can be felt. Bobo Choses is undoubtedly a brand that speaks the language of children. Its most important values include, above all, creativity, passion, honesty and an extraordinary sense of humour. All of that makes Bobo Choses an excellent playmate for every game!